It’s been nearly a year since we lifted the Aegis in the KeyArena. A year of preparation, continued success, and even tribulation marked the road from that point to where we stand now. We’re hungry again. 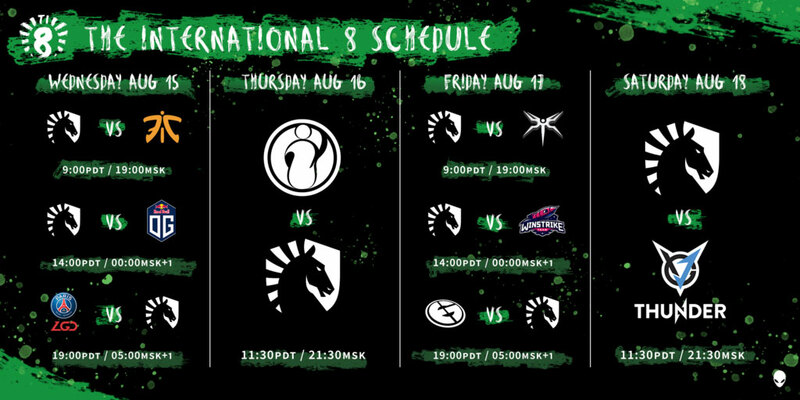 This week we lay it all on the line and begin our battle to the top of The International 8. Vancouver, a city of sea, land, and air. Now, home to the greatest competition in Dota history. If you’re one of the lucky attendees of The International 8, you’ll find yourself in a beautiful city full of food, entertainment, and for the next week and a half a whole lot of action. Our preparations are complete. From here on we’re focused on one thing: the Aegis. Any challenge that stands before us will be met with confidence and determination. The International is not just an 18 team free-for-all in our eyes, it’s us against them, 1 vs 17, and we’re ready to go through everyone to claim our prize. Now is the time to put all our practice and preparation to use. The carefully crafted strategies we’ve tempered until they’ve become nigh unbeatable will pave us an emerald road to our second International championship. The final piece is you. From the stands in the Rogers Arena, from your homes across the globe, your cheers and support will fuel the fire. We’re ready to defend our throne and lift the Aegis once again. For you to understand this incredible tale of triumph and humility, the scene must be properly set. It's DreamLeague Season 9, March 2018, and all of the teams competing are all equally exceptional at Dota 2. But each team also has their own strategies and styles. Strategies that when unleashed might give them just enough edge to defeat one another. So what do you do when Miracle is not able to play in DreamLeague and you're down one support? You can't bring in a support stand-in from another team's bench. No way. The upcoming match-ups are too close this season. It feels like any team has a chance to wreck at DreamLeague. You can't bring in a player from the outside who will take all he learns from your team and bring it back to his own team. Lee “Heen” Seung Gon is a pro Dota 2 player who has been Team Liquid's coach for the past two years. It stunned the pro scene and viewers alike when Heen became the stand-in support for Miracle at DreamLeague. And the bold maneuver gained us even more attention when Heen helped the team courageously climb all the way up to third place, trailing just behind Team Secret. It's a remarkable story that has left our fans with two major questions. And we will be investigating these inquiries with the help of Heen himself, who spent a lot of time since DreamLeague looking back on this extraordinary tale. Question 1: Did Heen's experience as a coach help with his performance at DreamLeague Season 9? After standing in during scrims a few times when GH was sick, the team's consensus was that “Heen's not as bad as we tease him to be.” It's honestly no surprise that after nearly three years of pro play, he retained quite a bit of skill in Dota 2. But it was easy for him to feel the effects of not playing the game consistently these past few years. "I was rusty," Heen admitted. "As a coach, I don't get nearly enough play time as I used to as a player, so the game felt foreign." Despite his in-depth insight into Dota's gameplay and game-winning strategies, his performance at DreamLeague was still hindered. As an amazing coach, Heen was able to spot things that needed to be done, but he openly admitted he wasn't as sharp and flexible as he needed to be to get it done the way he would have wanted. "The level of competition is much higher since the last time I played," he noticed, so my mistakes got punished much harder than ever. Because of his inability to keep up with the rest of his team in a way he found useful, Heen often stuck to playing Ancient Apparition. I even mentioned AA as my most comfortable hero before the tournament," the insightful coach noted. I don't play enough to even have a signature hero at this point, so AA seemed like the perfect hero for me as his early game is one of the strongest among POS 5, and he has a clear purpose in the game of blowing people up." Unlike when he was playing full time for MVP, Heen didn't feel as immersed during DreamLeague while being a TL stand-in. He was more used to the perspective of a “bird's eye view” by that point, so his focus had shifted to enabling the team to play “as usual,” Heen explained. I just wanted to blend in and make them almost forget that they were playing with a stand-in." One of the most difficult things for Heen to adjust to was taking over Kuro's job of coordinating the rest of the team and identifying objectives and pressure points. Since Kuro was busy playing the core role, which requires more attention to his own hero, I tended to play 'safe' which meant there was a high chance I wasn't having as much impact as I could," Heen recalled. But everyone knowing their own purpose is really a big component in being a successful Dota team, and that's something Heen was very keen on as a coach. And it's something that really helped us move forward at DreamLeague. Heen remembered a play where MC called for a blackhole/buyback bait late game that almost took them to victory right then. When MC voluntarily suicided into blackhole, no one was scared any more. We weren't thinking, 'but who's going to tank the blackhole? How should we position ourselves and who should we target?'" explained Heen. That single moment of decisive self sacrifice made everything 'obvious.'" While Heen's fingers may not move quite quick enough for his liking, it's still clear that his eye for strategy, problem solving, and move prediction helped us get that third place spot. The team may have joked about "avoiding last place," according to Heen, but reaching third place matched up with their tourney goals going into DreamLeague. To reach those goals and perform up to par, Heen stated that he had to be as “playerish as possible.” He still resumed some coach duties at night, like preparing drafts, but at the end of the day, Heen felt the team would only win if he "tried to do a crash course in playing." Next time, he will have more than AA prepared. Question 2: Did playing at DreamLeague with the team help Heen with his performance as a coach going forward? I really enjoyed our wins, even though we didn't make it to the very end, Heen noted. Having felt how great it feels to win as a player, it motivates me to win more as I'm reminded how much it means to the players to win or lose. If the team loses, our team morale understandably goes down for a few days, but having experienced both winning and losing helps me sympathize with how they must be feeling instead of myself just telling them the conventional wisdom of 'let's learn from our losses and look forward.'" For Heen as a coach, he had grown accustomed to only noticing the monitors: plays that need to be improved, tactics to work on and strategies to win in various situations. But it had started to take him away from what truly happens down in the trenches. Playing with his team gave him that much needed up-close and immersive insight to bring his coaching to the next level. It helped me understand the struggles they have in-game, such as not playing as aggressively as we hope to," discussed Heen. For example, players often mention after a poor performance that they 'couldn't do anything,' but after having my share of subpar games [at DreamLeague] I now understand what they meant. The disease of thinking alone is dangerous. If I can't do something by myself, then I can't do anything but farm." It’s clear that Heen gained a lot of insight into player psyche when he was allowed the opportunity to play beside his team at DreamLeague. But Heen has had a deep understanding of players’ mindsets even before he became a Liquid coach. In fact, that’s one of the reasons we were drawn to Heen as a potential coach. His leadership has lead the DotA 2 team to many memorable moments, the deep understanding Heen has of each individual player on his team - and the opposing team - allowing Team Liquid to forge ahead. Epicenter was very memorable for me as a coach," Heen said of Liquid's first LAN win of that season. Newbee was very strong at the time, and we outsmarted them in the finals. I felt like our talks outside the game were being implemented in a tangible way." Like many coaches, Heen still misses the feeling of being a pro player. Of playing up on stage in front of the crowds. Being in the middle of the action. The adrenaline pumping through your veins, eyes darting around the monitor, fingertips hungrily hovering just millimeters from the mouse. Waiting to strike. But just as he is understanding and conscious as a coach, Heen brings that keen and practical thinking to real life as well. Playing is still more hype than coaching for me, but I have to maintain a realistic perspective," he said, getting ready to analyze this proposition with an acute sense of awareness. The amount of time I've spent playing the game in the past three years is less than I played in one year as a player. What strengths do I have that make me unique and valuable as a player? Playing is also a bigger emotional investment, which takes away from my ability to stay objective as a coach. I have only 'considered' it in a way that people consider what it's like to time travel." The rare occurrence of a coach stepping in during a tournament is something that captivates esports fans, an intriguing situation that fascinates viewers with the concepts of nostalgia, of someone going back to their roots, to their core, and rediscovering their passion for the game all over again. The crowd waits on the edge of their seats, waiting to see Heen use this new excitement and perspective in upcoming tournaments. Waiting to see just how far Heen can bring his team next time.